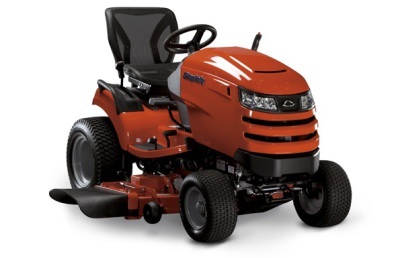 Step up to high value with a snapper lawn tractor. All-steel construction including the hood, cast iron front axle and a hydrostatic transmission are hallmarks of premium tractors - all at a value price. Easy-to-use height-of-cut controls. Responsive foot pedals give you hands-free control over forward and reverse speed. Dash-mounted cruise control lets you set you speed. With a 14" turning radius, you can spend less time mowing and more time enjoying your yard. When you are looking for a lawn or garden tractor, there are many manufacturers and features from which to choose. But if you focus on what's important, quality of cut and having a great looking lawn, the decision will be easy... Simplicity. The secret to getting a beautiful looking lawn is the Simplicity Free Floating™ Mower Deck with full-width rollers. This exclusive Simplicity mower deck features infinite height-of-cut control, freedom to float up or down at the rear and to pivot with the front axle. You can follow every ground contour for a clean, smooth and precise cut through the entire yard and not to mention create ball-park style striping effect.